New Nordic Frutin chews are an health supplement for stomach acid problems after meals, during stress, before bedtime & during late pregnancy. New Nordic's chewable Frutin® tablets are recommended to people in order to cope with stomach acid problems after meals, under stress or before bedtime. Frutin may also be recommended during the last part of pregnancy, when stomach acid can be pushed up into the oesophagus. 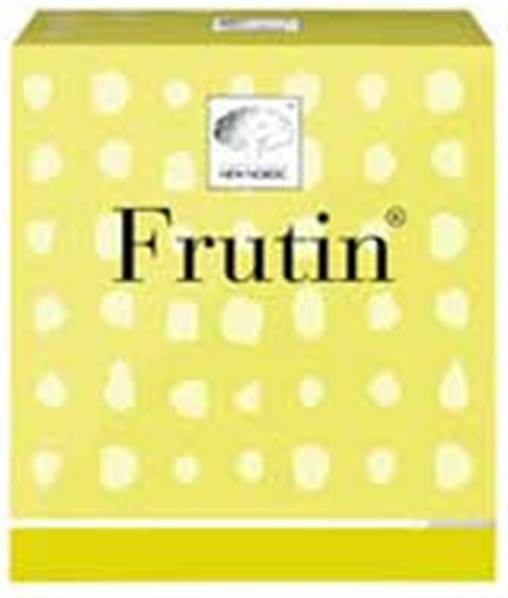 Frutin is a truly unique tablet based on natural Dolomite calcium from the northern part of Norway mixed with a very special fruit fibre blend. The Dolomite, when chewed, neutralizes acid in your stomach and the fruit fibres form a soothing protective foam lid in the upper part of the stomach, also protecting the oesophagus lining. The content of peppermint oil helps promote a healthy digestion. 1- 2 tablets to be chewed after a meal or as necessary. Suitable throughout pregnancy and breast feeding. Children under 12 years should only take this product after consultation with a GP. Keep out the reach of children. Food supplements should not replace a varied diet and healthy lifestyle. Can be taken during pregnancy. CAUTION: If taking more than 1 tablet per day, we suggest you balance it with a similar amount of magnesium. We do not recommend taking more than 2 tablets per day. If symptoms persist, consult your medical practitioner or nutritional therapist. Sorbitol, Natural dolomite, Fruit fibres, Vegetable Magnesium Stearate, Silicium dioxide, Peppermint oil. Negligible energy, protein, carbohydrates and fat. Can Frutin be used during pregnancy? 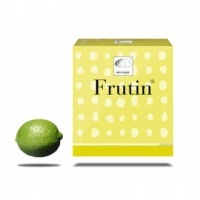 Frutin can be used throughout pregnancy because it contains only natural fruit fibres. Can I take Frutin if I am taking prescribed medication? Yes. Frutin is a natural and safe product and can be taken with prescribed medication, but if you have any concerns or questions always consult your GP or pharmacist.